It's Monday again...and I hope your week is off to a good start! Today, I want to share with you a very simple Filipino dish that my mom used to cook often because it's so easy to prepare and is really very economical. 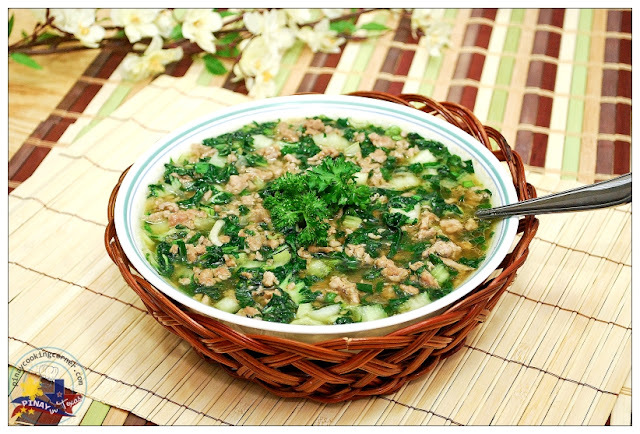 It's simply pechay (a green leafy vegetable which is the Filipino Bok Choi) sauteed with ground pork. In the Philippines, pechay is available in the market all year long. It is also one of the common vegetables that can be found in many backyard gardens, so you can buy it really cheap. But cheap as it is, it is packed with nutrients! It is rich in Vitamins A & C and in folate too. It also has small amount of calcium, iron, protein, niacin, thiamine, riboflavin, vitamin B-6 and Vitamin K. Pechay has that crisp and mild sweet taste that make it so good in soups and stir-fries. 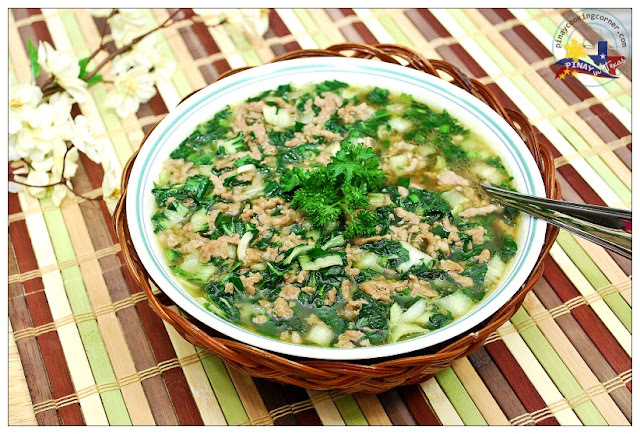 This Ginisang Pechay that I have for you is the simplest way of cooking it. Just like my mom, I enjoy cooking this nutritious and tasty dish! With just a bundle of pechay, a little ground pork and some spices, this will be ready in no time! You should try it! 1. In a pan over medium heat, saute garlic in olive oil until light brown. Add onion and saute until translucent. Add Knorr pork cube and saute until melted. 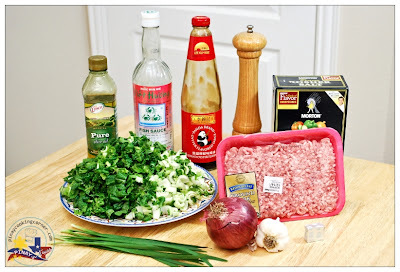 Add ground pork. Saute until juice starts to come out. 2. Add water and fish sauce. Bring to a boil. Reduce heat to medium low. Cover and simmer for about 10 minutes or until pork is tender. Season with salt and pepper to suit your taste. Add stalk part of the pechay and simmer for about 2 minutes. Add chives, leaf part of pechay and oyster sauce. Simmer for 2 more minutes. 3. Remove from heat. Transfer to a serving bowl and serve with hot rice. I think I can smell this coming through the computer screen! Delicious as always Tina! I hope you have a wonderful week my friend! Bok Choi is another fav of mine and the price is affordable. A few bunches comes with a price tage of RM1-2.00 and its a lovely green for a thick a stew, just this delicious and flavoured one you made. I have never thought of making a stew and its perfect though I need to use chicken minced. I can have this stew with a bowl of rice. Great family recipe,very simple with great ingredients !! Delicious dish with both green and pork.Nice one Tina. I've never cooked bok choi like this. I'm so tired of eating stir-fried bok choy with garlic (typical Chinese dish) and I'm going to give this a go! Thank god...I'm excited for our new bok choy recipe, SERIOUSLY! LOL. Hi Tina, this dish look appetizing. Thanks for sharing with the step by step photo, excellent! This is a beautiful dish Tina! Something between a soup and a stew right? Looks very comforting! I have the same fish sauce. I don't use it often and just saw that it says to refrigerate after opening. I grew up with patis in the cupboard not in the fridge so I didn't know. It's too late because I just put it in the pan. Do you refrigerate yours? It's in #2. You add it with the chives and leaf part of pechay.